The classic sophistication of cultured pearl takes on a fun and fashionable new attitude. 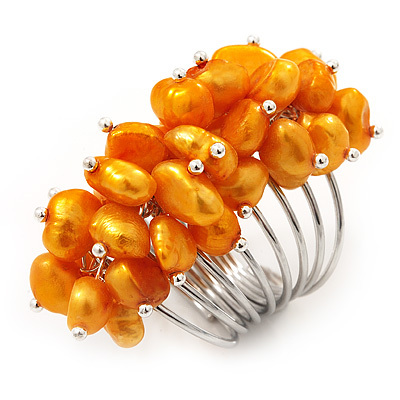 A cluster of orange coloured freshwater pearls offers a bold amount of eye-catching luminosity. It's a statement piece your sure to love. The pearls connected to a silver-tone, wide wrap-shaped metal band with small rings. The head measures about 40mm x 20mm, the shoulder about 25mm and tapers towards the shank to 8mm.